applications such as track use. 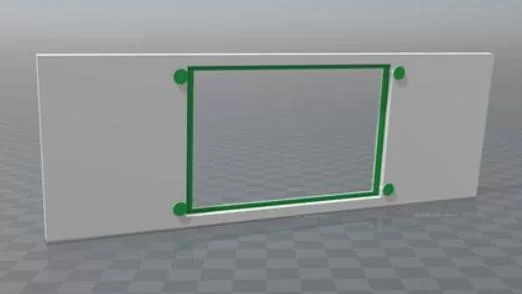 The end product should be low-cost, reliable, and expandable. addition of things such as GPS modules, IMUs, etc. to further improve its capability. being able to monitor important vehicle information such as temperatures, pressures, DTCs, etc. is vital. All collected data should also be logged so that it can be analyzed at a future time (e.g. the rest of the hardware mounted behind the faceplate. once the ignition is turned off to allow the Pi to safely shutdown. (Figure 1​), but they are free to choose from one of five OBD-II signal protocols . development vehicle uses ISO 9141-2 at a speed of 115200 baud. exact parameter of that mode. For example, if we want to get a list of all supported PIDs of mode 1, we would send “0100”. RAM. It interprets the raw OBD data and converts it so that it can be transmitted over UART. touchscreen display with enough room behind the screen for the Raspberry Pi. little (if any) user interaction on a day-to-day basis. on a final design (Figure 3​). simple script that will be run separate of m3_pi.py and will handle safely shutting down the Pi. code into a single module. actually on (since it is only live when the key is in the “accessory” and “on” positions). the Pi to shut down safely. (Figure 4​) as a proof of concept. was configured so that it used the exact same ISO 9141-2 protocol as the target vehicle. With the emulator working, I was able to get data from the ECU to display on the basic GUI. fire callbacks for the different queries as soon as new data is available from the ECU. table with the theoretical speeds the vehicle would be at a given RPM and gear. still idling at around 800 RPM). 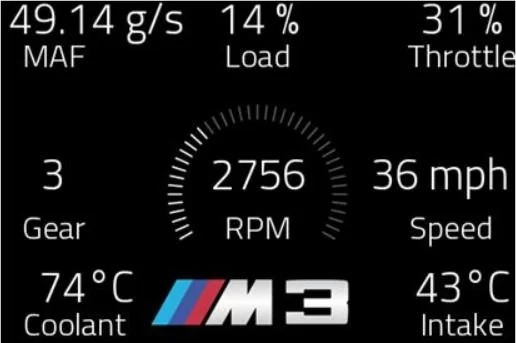 you’re at, without actually needing to read the exact RPM number. GUI but wasn’t in the car or had the OBD emulator handy. exposure I had to MCUs in CPE 329, so I was extremely excited to get to work with one again. Pi for 45 seconds once the ACC line goes low. 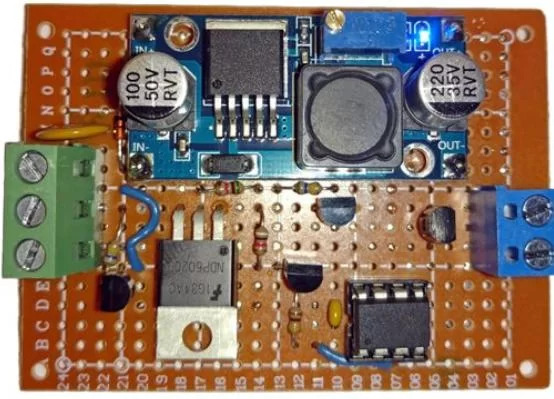 The board uses a Texas Instruments LM2596 DC-DC converter to step the 12V battery power down to a stable 5V input for the Pi. ASTMicroelectronics 78L33 linear voltage regulator is then used to step that 5V down to 3.3V for the ATtiny85. When the ACC line goes low, the power supply board sends a high signal over an output line that is connected to a GPIO pin on the Raspberry Pi. When the Pi sees this pin is high, it it will execute a full shutdown with sudo shutdown -h now. This process only takes 10 seconds or so, which means the Pi will be fully shut down before power is cut to it. diagram can be found below (Figure 10​). screen, and also added mounting holes to mount the screen to the faceplate (Figure 11​). high-quality print in the near future. of the vehicle being started. great deal of testing, and I’ve yet to find any major issues. g-force data. All of the IMU data would then be logged alongside the rest of the current data. that will show the vehicle’s speed and current gear at every point on the trip. the car that communicate over CAN bus (lock the doors, switch on lights, etc.). 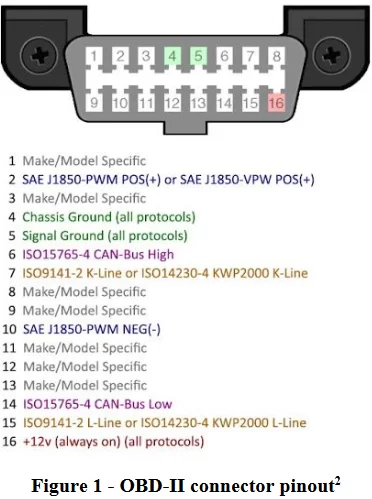 world so that anyone can add an OBD computer to their vehicle. the Adafruit kernel that enables the touchscreen. you should see a ton of debug lines scroll by on the monitor as the Pi boots up. your hostname, password, and enable SSH (so that you can access the Pi remotely). sudo apt-get update and sudo apt-get upgrade. for this paper, so I highly recommend checking out their documentation. package manager, Python dev tools, and the Pygame UI framework. is directly linked to rpmList. # List of RPM values for above LUT. # Helper function to draw the given string at coordinate x,y, relative to center. # Connect to the ECU and GPS. # Give time for the ECU to connect before we start the GUI. # Load all of our tach images into an array so we can easily access them. # Load the M3 PI image. create it normally for use on normal monitor. # Create a clock object to use so we can log every second. # Create the csv log file with the specified header. # Debug: Instead of reading from the ECU, read from a log file. # Read the log file into memory. # Get the length of the log. # Rename our CSV to include end time. # Close the connection to the ECU. # Toggle the settings flag when the screen is touched. 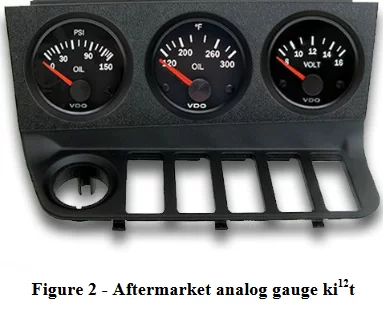 # Figure out what tach image should be. # Figure out what gear we're *theoretically* in. 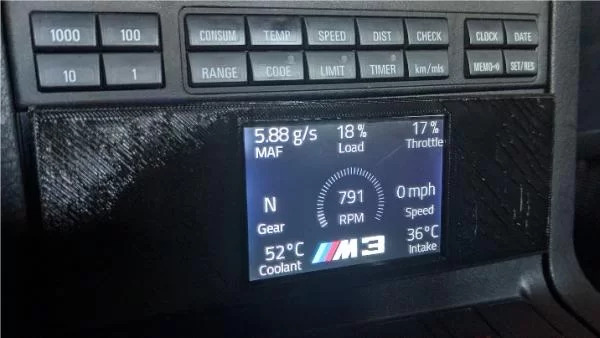 # Calculate coordinates so tachometer is in middle of screen. # Draw the RPM readout and label. # Draw the intake temp readout and label. # Draw the coolant temp readout and label. # Draw the gear readout and label. # Draw the speed readout and label. # Draw the throttle position readout and label. # Draw the MAF readout and label. 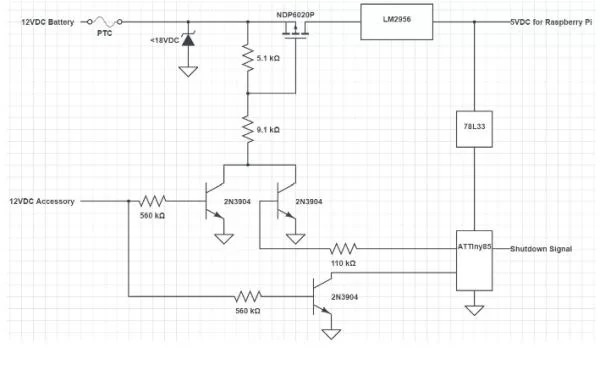 # Draw the engine load readout and label. # If debug flag is set, feed fake data so we can test the GUI. # Debug gui display refresh 10 times a second. # We only want to log once a second. # Log all of our data. 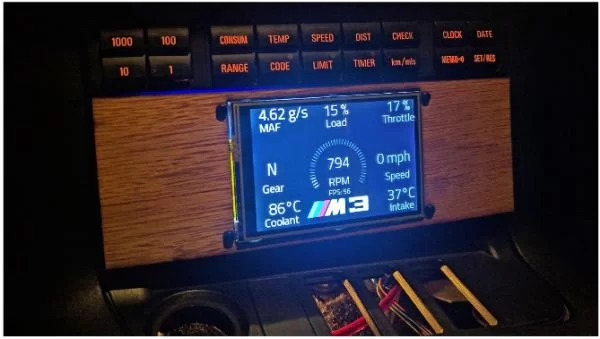 # Function to figure out what tach image we should display based on the RPM. return the index of it. 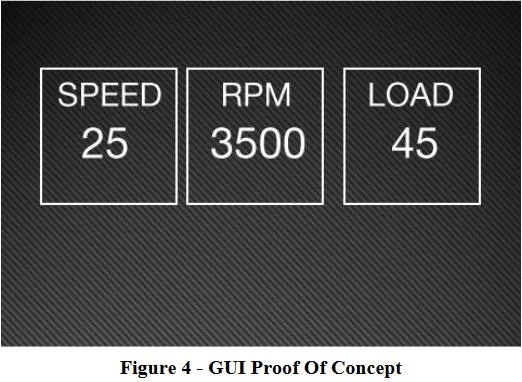 # Given RPM and speed, calculate what gear we're probably in. # We're stopped, so we're obviously in neutral. # We're moving but the RPM is really low, so we must be in neutral. # We must be in gear. # Find the index of the closest RPM to our current RPM. # Find the index of the closest speed to our speed. # DEBUG: Set debug logging so we can see everything that is happening. # Connect to the ECU. # Watch everything we care about. # Set the ready flag so we can boot the GUI. # Function to create a csv with the specified header. # Write the header of the csv file. # Function to append to the current log file. # Function to close the log and rename it to include end time. # Debug function to read from log file for GUI testing. # Debug function that reads from log file and assigns to global values. clipping when displayed on GUI. # Set GPIO pin 17 as input for shutdown signal. 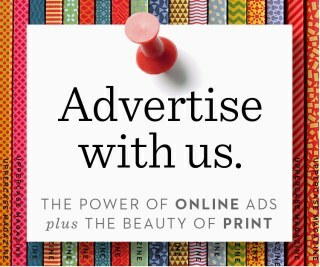 # Print message to console. 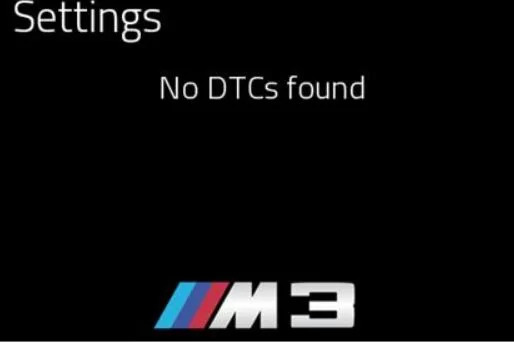 less than a year before the M3 was manufactured.